Psychological Testing is used for routine evaluation (e.g., 504 or IEP planning, pre-admission evaluations) and to clearly identify psychiatric conditions which may be complex and/or treatment resistant. 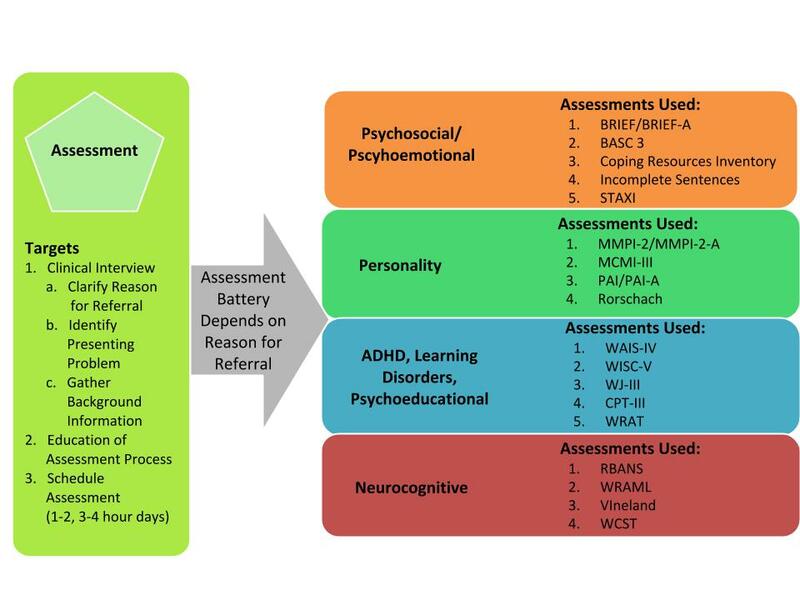 Our assessment team performs comprehensive psychological evaluations to assess academic achievement, memory, cognitive functioning, personality and behavioral functioning in children, adolescents, college students, and adults. All assessment services include an initial interview, an interpretive conference following completion of the assessment, and a written report of the assessment results with recommendations. Intelligence tests are used to measure intelligence, or your ability to understand your environment, interact with it, and learn from it. Personality tests are used to measure personality style and traits. Personality tests are commonly used to assist with clinical diagnoses. Attitude and psychosocial, emotional, or behavioral tests are used to measure how an individual feels about a particular event, place, person, or object. They are also used to measure the level of distress and impact one’s symptom manifestation is having on an individual’s social, emotional, or behavioral functioning. Achievement tests are used to measure how well you understand a particular topic (i.e., math, verbal language, written expression, etc.). Aptitude tests are used to measure your abilities in a specific area (i.e. clerical skills). Neuropsychological tests are used to detect impairments in your cognitive functioning that are thought to be a result of brain damage or degeneration. For example, if you were to have a stroke, you might have a neuropsychological test to see if there is any resulting cognitive damage (i.e., decreased ability to think due to damage in a brain pathway). If you are interested in learning more about Psychological Testing and Assessment, please contact us.